Izzy Eats: The art of raising a gourmand, one bite at a time: Green Eggs and Ham Cookbook: Izzy's Own Julie/Julia Project? 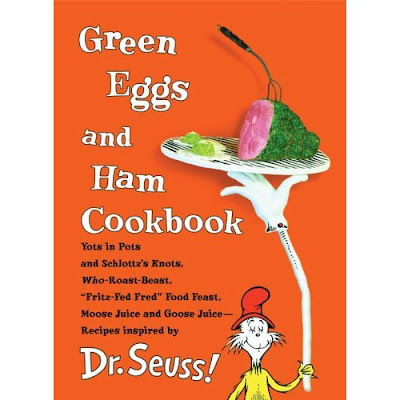 Green Eggs and Ham Cookbook: Izzy's Own Julie/Julia Project? Uh oh, I think Izzy is envisioning his very own Julie/Julia project . Only his would be more like the Izzy/Suess project. You see he received this cute, silly, somewhat revolting cookbook for the holidays (Thanks, I imagine, to Izzy's cousin J.) and has been pondering all of the recipes ever since. He rifles through the pages asking things like, "Can we make the "Nook Hook Cook Book Dogs?" The name alone hardly conjures up something innately edible and the recipe just so happens to be a truly vile combination of roasted wienies with baked beans, ricotta cheese and black olives, all served in a bowl. Now I do see the humor here but the question is, should I humor Izzy by actually allowing him to prepare that ill-conceived concoction? The jury is still out on that one. Suffice it to say, we skipped that recipe for the time being and went straight to the Pink Yink Ink Drink which had a certain allure, even for me. This would make a striking sip for any little pink-lover's birthday and it was a perfect, quick after-school project. Izzy and I were both enamored of the results. Pretty in pink it is and not only that but it is healthy and tastes good too! 1. Put blackberries in blender and puree. Pour into a large glass. 2. Put milk, other berries and honey in blender and blend til frothy. 3. Carefully pour on top of puree. Add a straw and sip. Petulant, aren't we just a tad?? You know I love this book, despite its utter vileness.